Copyright © 2003 W3C® (MIT, ERCIM, Keio), All Rights Reserved. W3C liability, trademark, document use and software licensingrules apply. 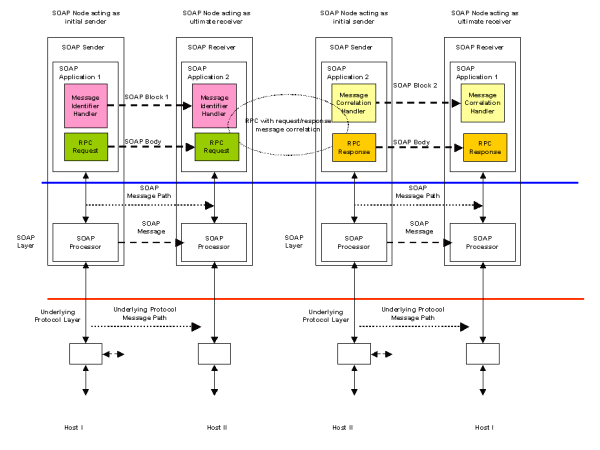 This is the second W3C Working Draft of the Web Services Architecture Usage Scenarios. 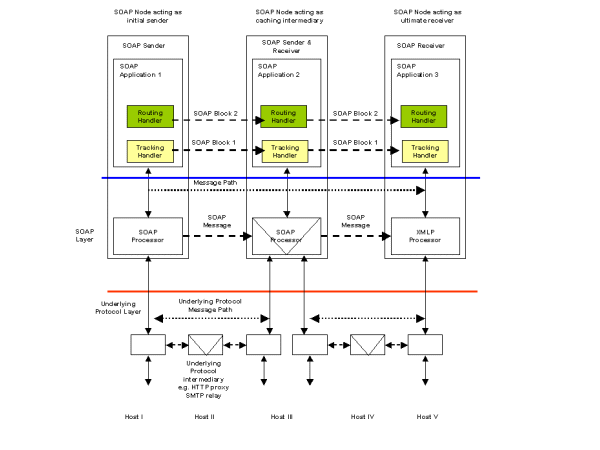 This document was produced by the Web Services Architecture Working Group, which is part of the Web Services Activity. Some corrections have been made since the last publication of this documents, and some work has been done on creating a more static version of the travel agent use case. Some issues against this document are still open and will be addressed in the next version. 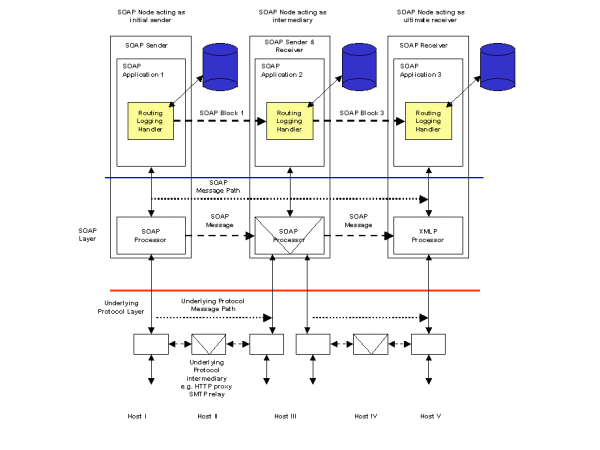 For a detailed list of changes since the last publication of this document, refer to B Web Services Architecture Usage Scenarios Changes. A list of open issues against this document is maintained by the Working Group. 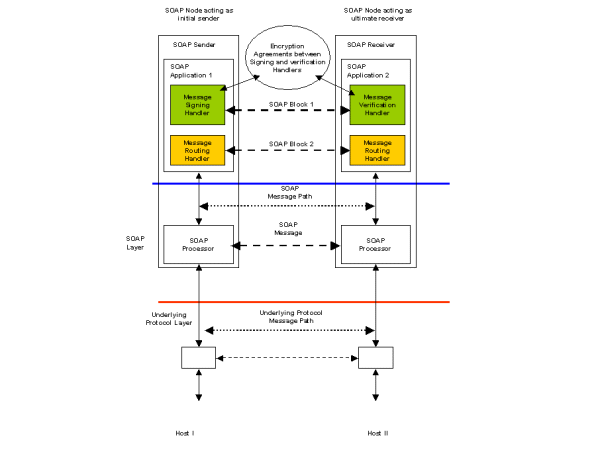 Discussion of this document takes place on the public www-ws-arch@w3.org mailing list (public archives) per the email communication rules in the Web Services Architecture Working Group Charter. 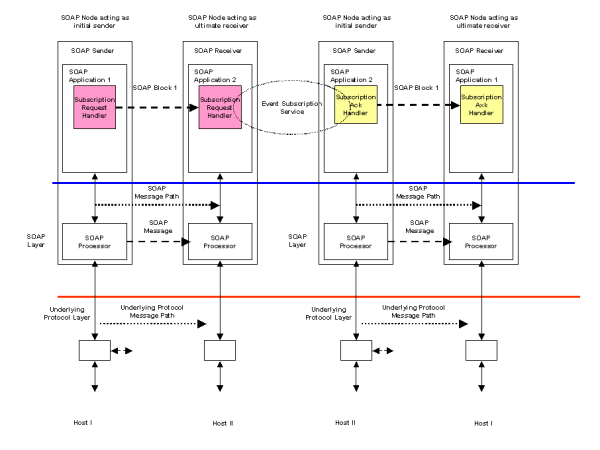 This is a public W3C Working Draft for review by W3C members and other interested parties. It is a draft document and may be updated, replaced, or obsoleted by other documents at any time. It is inappropriate to use W3C Working Drafts as reference material or to cite them as other than "work in progress". This is work in progress and does not imply endorsement by, or the consensus of, either W3C or members of the Web Services Architecture Working Group. A list of all W3C technical reports can be found at http://www.w3.org/TR/. 3.1.5.4 Developer creates travel agent web service that queries for airline flights. A Sender shall be able to specify information in a message for its internal use. The sender shall send the same information for subsequent messages in a given conversation. The receiver is required to echo this information for messages in a given conversation. An example of this is a client-side conversation ID. A Receiver shall be able to specify information in a message for its internal use. The receiver shall send the same information for subsequent messages in a given conversation. The sender is required to echo this information for messages in a given conversation. An example of this is a server-side conversation ID. A sender wishes to exchange data with a receiver and has agreed to encrypt the all of or a portion of the payload. 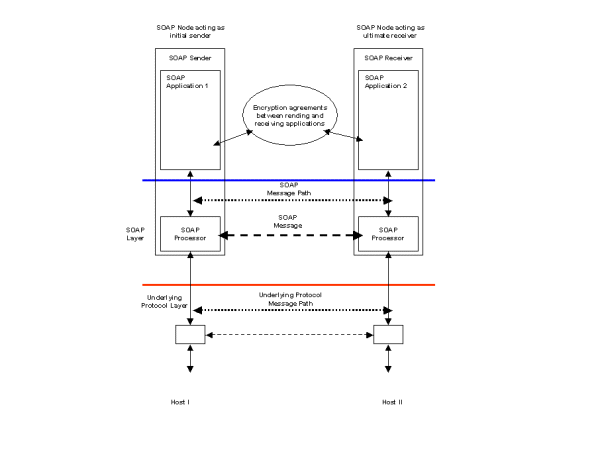 The sending and receiving applications agree on the encryption methodology. 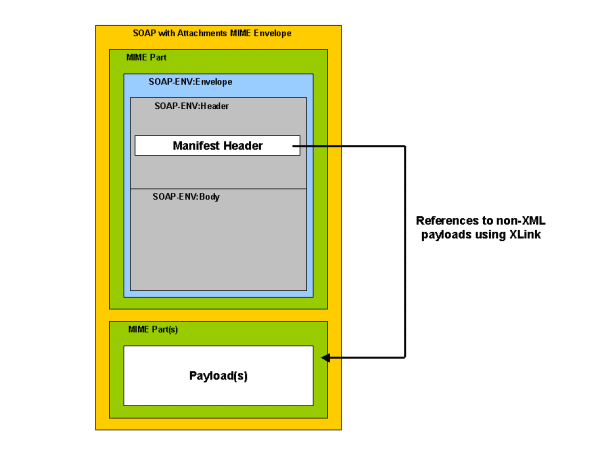 Data is encrypted by the originating application and sent to the receiver via SOAP. The data reaches the receiving application untouched, and may then be decrypted in the agreed-upon manner. This scenario is applicable to the Travel Reservation Use Case (see 3.1 Travel agent use case, static discovery). 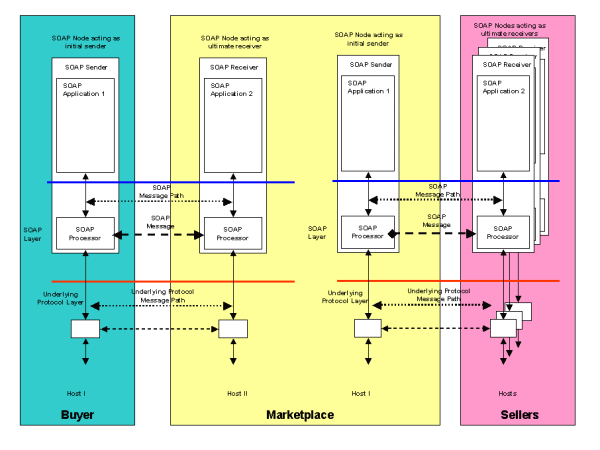 Two trading partners engaged in a message exchange may agree to cryptographically sign and verify one or more message header, such as a routing header or a conversation header, and/ or the payload. The sender or originating application may perform the signing of the payload. The sending message handler signs the message header. 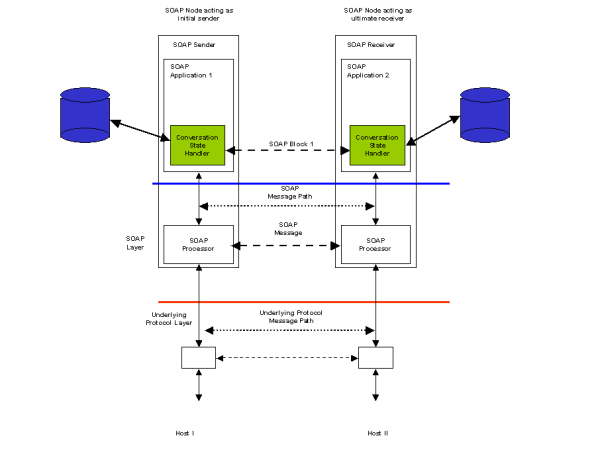 A routing header may be appended to the message header. 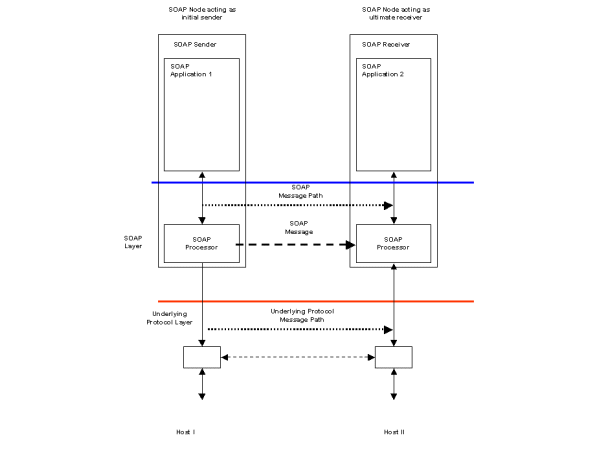 The routing header may also be signed by a message service handler. 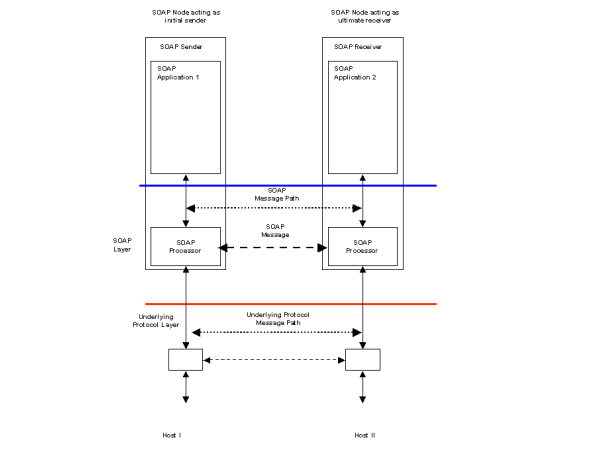 This scenario is applicable to the Travel Reservation Use Case (see 3.1 Travel agent use case, static discovery) for the communications to the credit card service, where the message is not being sent over a secure channel, such as SMTP. 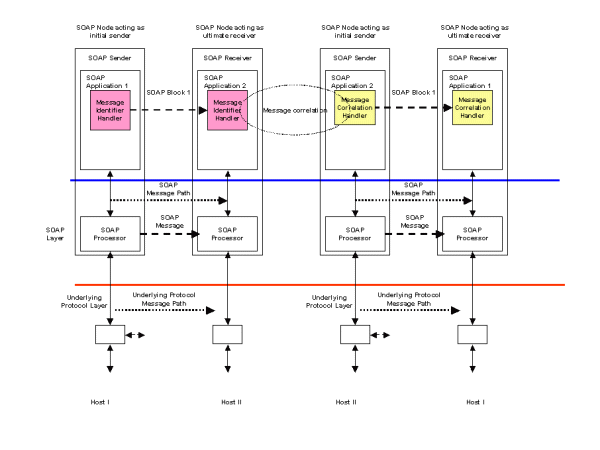 Two trading partners engaged in a message exchange may agree to cryptographically sign and verify an attachment, that is content that is not directly part of the SOAP envelope. The sender or originating application may perform the encryption of the attachment. 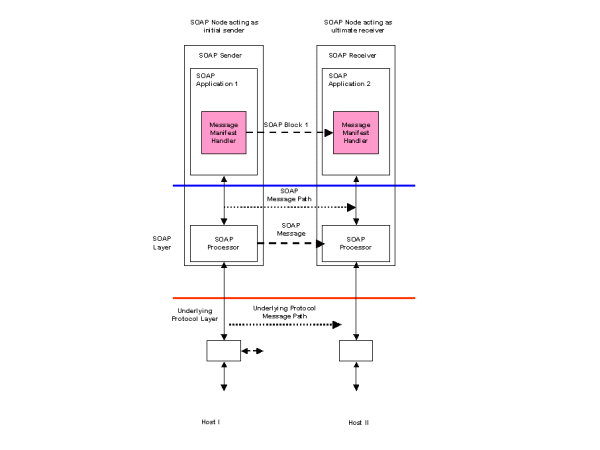 This scenario is applicable for the Travel Reservation Use Case (see 3.1 Travel agent use case, static discovery) for the communications to the credit card service, where a image of a signature is attached to the message. A webcam is plugged in to a network. A user sends through the network an HTTP request to get the video. The webcam answers to this request by streaming the video to the user. The user sends another request to stop the streaming. I think WSDL should provide a way to express that it will use streaming at some point. Streaming might be used at two levels: - at the protocol level : the service may transmit the result by streaming - at the datatype level : the service may indicate that it will receive/send streaming as input/output. If the identifier is a URL, then the developers tools interact directly with the URL according to a TBD mechanism. If the identifier is a QName, then how is the WSDL retrieved. Is there a potential issue? Credit card companies are provide services to guarantee payments made by consumers. This use case assumes that the discovery of the specific service providers and metadata happens prior to the invocation, and that a developer uses the description to create the web service invocation. This could be considered a "static" use case. 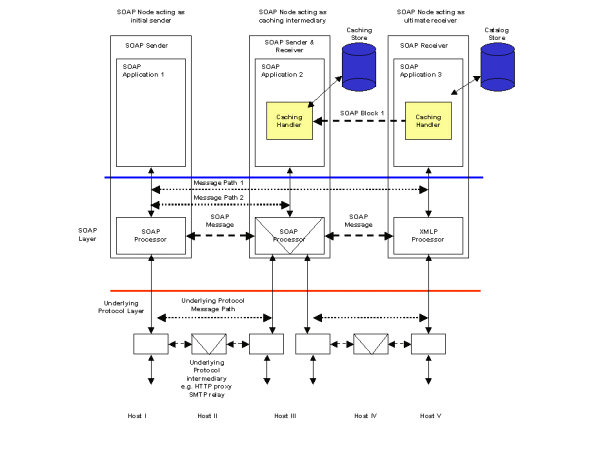 Developers use WSDL and platforms to create instances of web services. 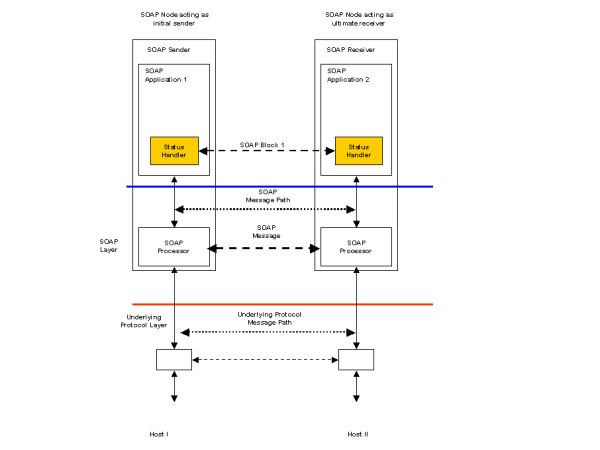 The following usage scenarios describe how a user would make a reservation for a vacation package (flight and hotel room), and how a developer would create a portion of a service. transactions: either compensating or atomic transactions may make the implementation of the reservation be of higher quality. The user has the location of a travel agent service. The travel agent service finds a list of flights from each service it has in its catalogue. The airline returns a confirmation identifier with an expiry date. The response indicates success with an authorization identifier, signed by the payment authority. The travel agent service sends the request accordingly, along with a payment authorization identifier from the payment service. The travel agent service sends the request to buy a ticket on hold, along with a payment authorization identifier from the payment service. The travel agent service sends the request to the payment service, along with the authorization identifier signed by the payment service. The service provides the user with various confirmation identifiers and wishes the user a good vacation. Communication with the payment service will requires confidentiality, which can be achieved with encryption technologies (e.g. 2.15 S061 Request with encrypted payload, 2.16 S062 Message header and payload encryption and 2.17 S0621 Attachment encryption). Communication with the payment service could require the image of a signature, aka a binary attachment, using attachments technologies (e.g. 2.24 S090 Sending non-XML data). Communication with the payment service should be delivered exactly once, using reliable messaging technologies (e.g. 2.7 S010 Request with acknowledgement). Communication with the payment service and the hotel reservation could be under transactional control, which can be achieved with transaction technologies (e.g. 2.23 S080 Transaction). The developer uses the identifier to retrieve a WSDL, (e.g. 2.37 S600 Address based Discovery ). 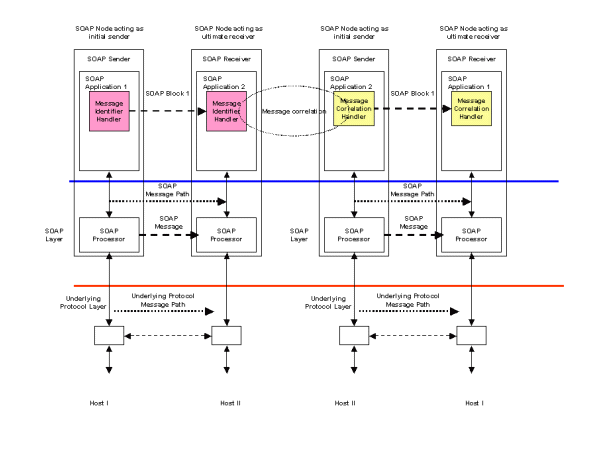 This scenario illustrates how a program, the travel agent service, can interact with airline services, hotel services, with prior knowledge of them and of he way they work. 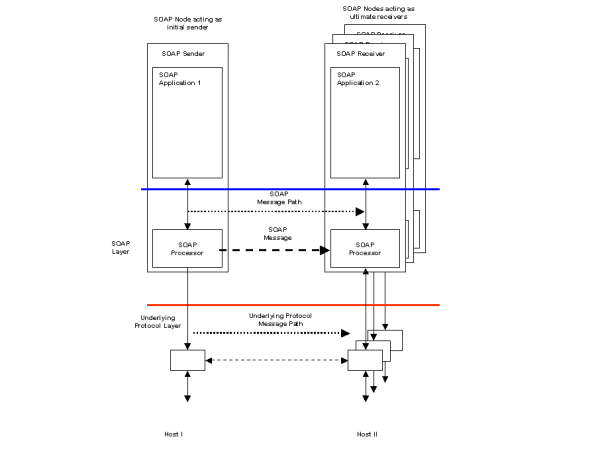 This use case is variation of the 3.1 Travel agent use case, static discovery, in which the description of the services is discovered at run time. There probably is some factorization possible with the previous section. The travel agent service finds a list of hotels. The travel agent service sends the request accordingly, along with the authorization identifier signed by the payment service. 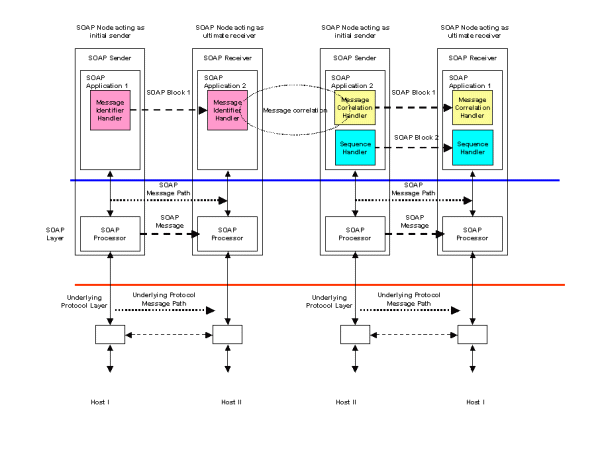 The basic transactions take place via Asynchronous Messaging. However, each of the steps of this process must also be reliable. That is, there is a process in place by which when a message is sent the sender knows that it will either get through or create an error condition, and that there is a high probability of it getting through. Each message generates a confirmation of receipt message back to the sender, that is, Request with Acknowledgement. In addition, each message carries a unique identifier, a date-time stamp (showing the time at which the message was sent, not necessarily the delivery time), and information that allows the messages to be logically ordered. (These capabilities will be exercised in subsequent scenarios). 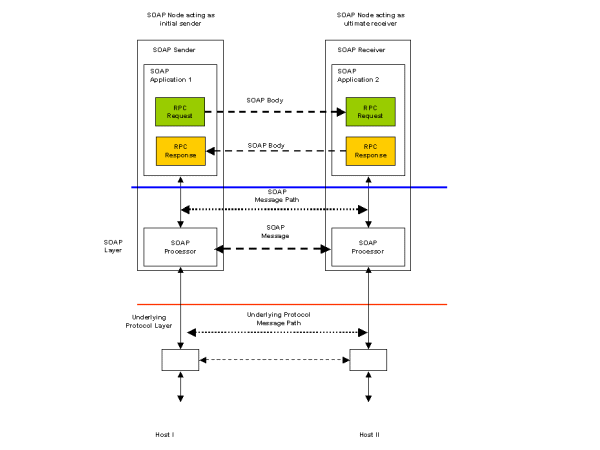 The identification requirements may be part of Conversational Message Exchange, although this Usage Scenario has not yet included these capabilities explicitly. Other aspects of security are also necessary. It must be possible for both BigCo and SmallCo to be sure that the messages they receive are actually from the company that they are supposed to be. That is, each company must be able to identify itself unambiguously (Authentication). In addition, there is the question of what actions the company is authorized to request from the web service. For example, BigCo needs to be able to query SmallCo's web service for a list of messages that have been sent between these two participants, but not for information about transactions with other companies that purchase widgets from SmallCo. Both companies need to be confident that the communications cannot be tampered with or observed by third parties, and that third parties cannot send communications pretending to be who they are not. The editors would like to thank the following Working Group members for their contributions to this document: Roger Cutler. Members of the Working Group are (at the time of writing, and by alphabetical order): Assaf Arkin (Intalio Inc.), Geoff Arnold (Sun Microsystems, Inc.), Daniel Austin (W. W. Grainger, Inc.), Mukund Balasubramanian (Infravio, Inc.), Mike Ballantyne (EDS), Abbie Barbir (Nortel Networks), David Booth (W3C), Mike Brumbelow (Apple), Doug Bunting (Sun Microsystems, Inc.), Greg Carpenter (Nokia), Dipto Chakravarty (Artesia Technologies), Jun Chen (MartSoft Corp.), Alex Cheng (Ipedo), Tom Carroll (W. W. Grainger, Inc.), Michael Champion (Software AG), Martin Chapman (Oracle Corporation), Ugo Corda (SeeBeyond Technology Corporation), Roger Cutler (ChevronTexaco), Jonathan Dale (Fujitsu), Suresh Damodaran (Sterling Commerce(SBC)), Glen Daniels (Macromedia), James Davenport (MITRE Corporation), Alan Davies (SeeBeyond Technology Corporation), Paul Denning (MITRE Corporation), Ayse Dilber (AT&T), Zulah Eckert (Hewlett-Packard Company), Gerald Edgar (The Boeing Company), Colleen Evans (Sonic Software), Chris Ferris (IBM), Shishir Garg (France Telecom), Hugo Haas (W3C), Hao He (The Thomson Corporation), Dave Hollander (Contivo), Yin-Leng Husband (Hewlett-Packard Company), Nigel Hutchison (Software AG), Mario Jeckle (DaimlerChrysler Research and Technology), Mark Jones (AT&T), Tom Jordahl (Macromedia), Heather Kreger (IBM), Sandeep Kumar (Cisco Systems Inc), Hal Lockhart (OASIS), Michael Mahan (Nokia), Francis McCabe (Fujitsu), Michael Mealling (VeriSign, Inc.), Jens Meinkoehn (T-Nova Deutsche Telekom Innovationsgesellschaft), Jeff Mischkinsky (Oracle Corporation), Nilo Mitra (Ericsson), Himagiri Mukkamala (Sybase, Inc.), Don Mullen (TIBCO Software, Inc.), Eric Newcomer (IONA), Duane Nickull (XML Global Technologies), Mark Nottingham (BEA Systems), David Orchard (BEA Systems), Srinivas Pandrangi (Ipedo), Mark Potts (Talking Blocks, Inc), Fabio Riccardi (XQRL Inc.), Don Robertson (Documentum), Waqar Sadiq (EDS), Igor Sedukhin (Computer Associates), Jim Shur (Rogue Wave Software), Hans-Peter Steiert (DaimlerChrysler Research and Technology), Katia Sycara (Carnegie Mellon University), Patrick Thompson (Rogue Wave Software), Steve Vinoski (IONA), Prasad Yendluri (webMethods, Inc.), Jin Yu (MartSoft Corp.), Sinisa Zimek (SAP). Previous members of the Working Group were: Mark Baker (Idokorro Mobile, Inc. / Planetfred, Inc.), Tom Bradford (XQRL, Inc.), Allen Brown (Microsoft Corporation), Daniela Florescu (XQRL Inc.), Sharad Garg (Intel), Joseph Hui (Exodus/Digital Island), Marcel Jemio (DISA), Timothy Jones (CrossWeave, Inc.), Jim Knutson (IBM), Mark Hapner (Sun Microsystems, Inc.), Bob Lojek (Intalio, Inc.), Anne Thomas Manes (Systinet), Joel Munter (Intel), Henrik Frystyk Nielsen (Microsoft Corporation), David Noor (Rogue Wave Software), Kevin Perkins (Compaq), Darran Rolls (Waveset Technologies, Inc.), Krishna Sankar (Cisco Systems Inc), Scott Vorthmann (TIBCO Software, Inc.) . 2003-04-15 HH Addressed issue 13. Added diagrams for travel use case. Started addressing issue 26: s/confirmation number/confirmation identifier/.